Time for Renewal! Let’s Open More Dates in 2016! The Dunsmuir Railroad Depot Historical Society’s Dunsmuir Museum has closed for the winter months and will reopen April 2, 2016. We need your help to keep the museum open! We would like to open the Museum twice monthly beginning in 2016 – only 14 open days. Please consider signing up for a Saturday – it’s easy and fun. Contact us at dunsmuirdepot@gmail.com, (530) 235-0839 or via our web contact form. We will have a ‘How to staff the Museum’ meeting in March 2016, date TBA. Don’t worry if you can’t make this meeting; just let us know if you would like to support opening the museum more often and together we’ll make that happen. Dues are due for 2016. Your $10 Depot membership and your $10 Museum membership check may be sent to the RR Depot Society at P. O. Box 324, Dunsmuir CA 96025. Should you wish to receive your newsletter via email, include your email address. All donations are welcome. April 18th – Museum reopened! May 23rd – Our 7th Annual Pie Social during Dogwood Daze had 85 pie makers donating 48 different pies totaling 175 pies; we were sold out by 1:30 pm. Many thanks to the pie makers and the Pie Social crew! June 12th-14th – RAILROAD DAYS – We sponsored the Amtrak Exhibit Train on Saturday for the national Amtrak Train Day. Their crew reported 1201 people toured the train; over 500 people visited the Museum. June/July – We had two Road Scholar groups visit the Museum (children and their grandparents from around the country). July 18th – Depot Society Ticket Drawing had all Dunsmuir winners. Myrna Dupyzk won ‘ENJOY DUNSMUIR,” Dave Fischer won the Norman Rockwell Fishing Quilt, and Sue Alameda won the Gypsy Rose Quilt. Thanks to all who participated in our drawing. October 10th – Museum open for the town’s Art Walk. October 18th – Museum closed for the winter months. The Depot building roof has been repaired. All the donated Museum items have been cataloged; computer entry is needed. The Amtrak Depot waiting room has been cleaned twice weekly this year. Volunteers of the Shasta Archives have worked their way through 1527 photographic images and scanned in 1136 of them, others are prints of original negatives. They have located where most were taken and have sleeved, numbered, filed and indexed into an excel spread sheet all the scans. Also have done the same with 51 drawings of stations, mostly Dunsmuir Roundhouse. They have begun to final sort and index smaller roll drawings, sorting work orders and correspondence into order, about 3-1/2’ into 50’ of files. 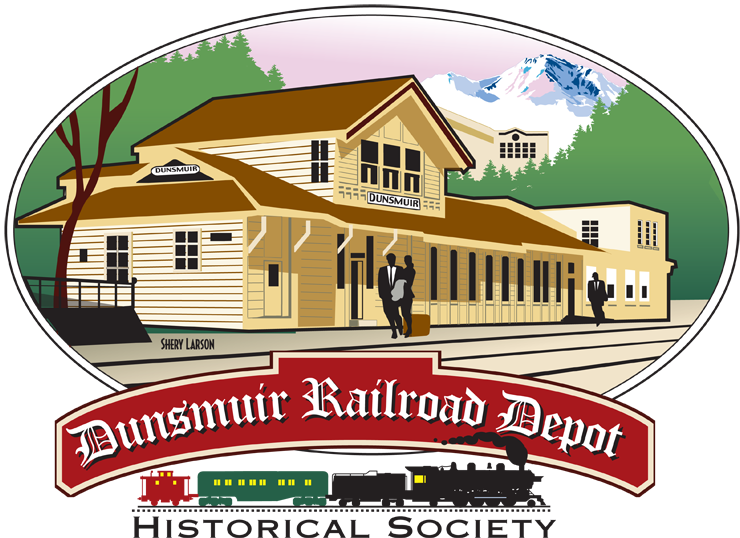 Your Depot Society memberships continue the maintenance of the Dunsmuir Depot (the only Siskiyou County stop) and the Dunsmuir Museum. Once again, thank you for your continued support. Next Past Winters in the Canyon!